This past summer, Americans were shocked and revolted when the Center for Medical Progress’ David Daleiden released several videos exposing Planned Parenthood’s depravity – selling babies’ hearts, livers, and brains for a profit. Finally, conservatives believed, the rose-colored lenses that Americans wear with respect to the largest abortion provider in the nation would be removed and they would see that Planned Parenthood’s driving interest is more about lining their own pockets than fostering women’s health. After watching disturbing interviews of Planned Parenthood employees callously discussing selling babies’ body parts over salad and wine at lunch, a firestorm of opposition to the organization arose emboldening 12 states and Congress to investigate, and, New Hampshire, Alabama, and Louisiana to defund Planned Parenthood. Conservative House Freedom Caucus Members led by Representative Mick Mulvaney (R-SC) signed a letter to Former Speaker John Boehner (R-OH) stating they were disturbed by “reports that Planned Parenthood was selling tissue of unborn babies for profit” and that they would not support any budget resolution that contains funding for Planned Parenthood. With the abortion giant under attack, Representative Nancy Pelosi (D-CA) and her pro-abortion cronies turned their sights on the video producers who exposed Planned Parenthood’s despicable behavior. The smear campaign was all encompassing to destroy the Center for Medical Progress’s reputation rather than disprove the assertions on the videos made by Planned Parenthood employees that the organization sells babies’ organs for profit. A liberal witch-hunt was at hand. On Monday, January 25, the Harris County District Attorney Devon Anderson announced that in a twist of fate, a Texas Grand Jury investigating a Houston-based Planned Parenthood for criminal activity ignored the videos exposing Planned Parenthood’s potentially illegal activities of selling aborted babies’ body parts and instead decided to go after the man who produced them. “Center for Medical Progress Founder David Daleiden was indicted on a felony charge of tampering with a governmental record and a misdemeanor count related to purchasing human organs. Sandra Merritt was also indicted on a charge of tampering with a governmental record,” the Associated Press reported. According to LifeNews, for going undercover, David Daleiden could face 20 years in prison while Planned Parenthood skates by scot-free. While David was indicted for purchasing babies’ body parts, Planned Parenthood was not charged for selling them – the largest abortion provider faces no consequences for their actions. In typical liberal fashion, the fox is guarding the hen house in Houston. As an example, a prosecutor for the Harris County District Attorney’s office, Lauren Reeder, serves on the Board of Planned Parenthood. While Devon Anderson said that Reeder would not be involved whatsoever in the investigation, this situation is not the first time the Harris County’s DA’s office has been impugned in an abortion issue. According to LifeNews, a previous grand jury failed to indict a Houston abortion provider despite ample photographic evidence and eyewitness testimony of late-term babies being born alive and intentionally killed. This coupled with the fact that the grand jury is subject to manipulation by a prosecutor with an agenda because of secrecy surrounding the process. “Planned Parenthood hoax officially blows up: Texas grand jury decides to indict video creators instead,” Salon.com elatedly tweeted in response to the news. “No irony can be more perfect than David Daleiden being indicted under the same law he said Planned Parenthood broke,” Daily Beast staff writer Samantha Allen tweeted. While the indictment of David Daleiden and Sandra Merritt seem to portend a bad omen for pro-lifers, Planned Parenthood is far from off-the-hook. Following the indictment announcement, Texas Governor Greg Abbott and Texas Attorney General Ken Paxton both issued statements that the state’s investigation into Planned Parenthood remains ongoing and the grand jury’s action will have no impact on the probe. Furthermore, the indictments focus attention back onto Planned Parenthood and its abortion business. 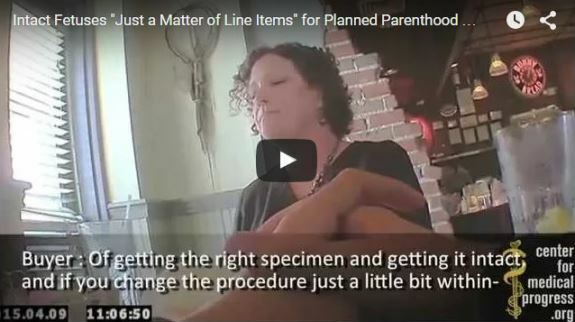 It allows pro-lifers to remind Americans that it was Planned Parenthood executives that were caught on camera haggling over payments for aborted babies’ body parts. The left’s attacks on the Center for Medical Progress focus on the legality of the recordings and the fact that the videos have been “edited.” Ironically, none of the Planned Parenthood executives have actually denied that they made the statements in the videos.